Apple, naughty Apple. You made SpriteKit and SKLabelNode, but not make multiline labelnode. This is supposed to be expected!! OMG!! UILabel has multiline function, why not SKLabelNode? Ok, lets not get crazy. Relax I am here to solve your woes. I'd like to give you alternatives (because some people already make some solution). The above isn't really a labelnode object. What it does is write down all the text with labelnode on a dummy space and capture it as image, and use that image as labels. Basically in your app it becomes SKSpritenode. This maybe is ok if you want a quick implementation. But capturing things into an image has lots of problems - namely memory usage, sizes (for example you need to cater for bigger screens making sure the image is not pixelated at high res, etc, etc). 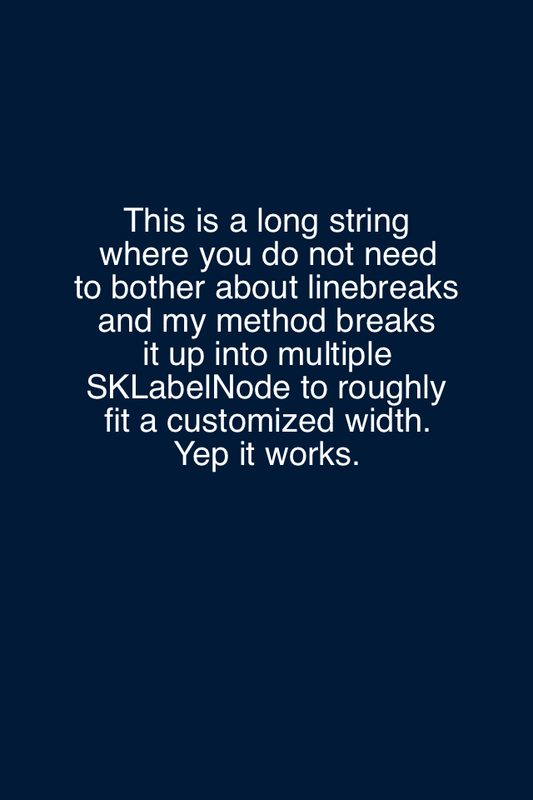 The second method above is probably what you want if you prefer to have SKLabelNode that can use the "\n" (linebreaks). This is OK-ish. But I really don't like manually putting the line breaks. Especially if I change the wording then the line breaks need to be redone again, which SUCKSKKKKSK... but this solution is actually not bad. This is how the app will look like when you run it. Those are SKLabelNodes! Ok now for the code. Read the comments to understand what each line does. // For the sake of testing, I just use a dummy NSString and hardcode the string I want to display. // This string can be anything - even a string of paragraph that you retrieve from the web or pdf or whatever. // parse through the string and put each words into an array. // get the number of labelnode we need. So that's all. Easy right? Feel free to improve it more. This method is ideal for games in SpriteKits. creating and positioning the multiline text easy. Rewritten it in swift, not sure if its 100% correct but it works. I guess the problem I've run into is removeFromParent(), so I can then change the paragraph each time the user taps the screen. I'll work on it as I go along, but if you have any tips, please let me know. Thank you! I should also note that I made mine as a func within my GameScene.swift file. This code is a lifesaver. Thank you!! Thanks to Shaun Hirst for making the swift version! And thanks all for nice comments. Always appreciate it. I'm really noob and I'm trying to "convert" your code to be used with swift 3. The problem I'm facing is that depending on the number of words per line and the number of words in the text, parts of the text are not shown. Lets say I choose for wordsPerLine the number 6 and my text has 20 words, in this case the last two words stay out. Any idea about how guarantee that all text will be shown and that I'll be able to centralize this text block in the middle of another node? myLabel.text = "one two three four five six seven eight nine ten eleven twelve thirteen fourteen fifteen sixteen seventeen eighteen nineteen twenty." lineStr = lineStr + " " + (words? [cnt])!